The morning after the election was a dreary one. The rain poured down and a heavy feeling sat in the pit of my stomach. I didn't sleep well due to staying up late to watch as the results came in, but I had scheduled this visit a while before and honestly, there were few places I could think of that I would rather be than out on the farm. Tucked away in the Snoqualmie Valley, Duvall is not so far from where I live. 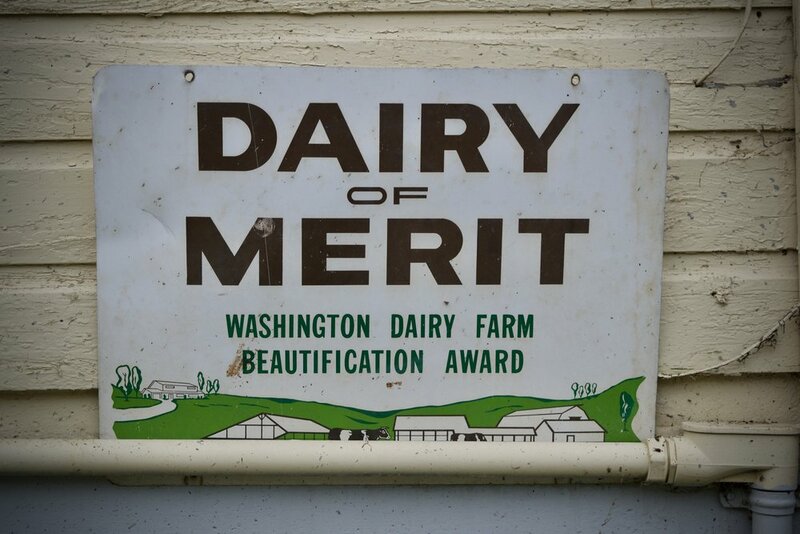 A 40 minute drive out of the city will get you right in the heart of Washington farmland. It was dark and rainy drive but not at all hard to find. 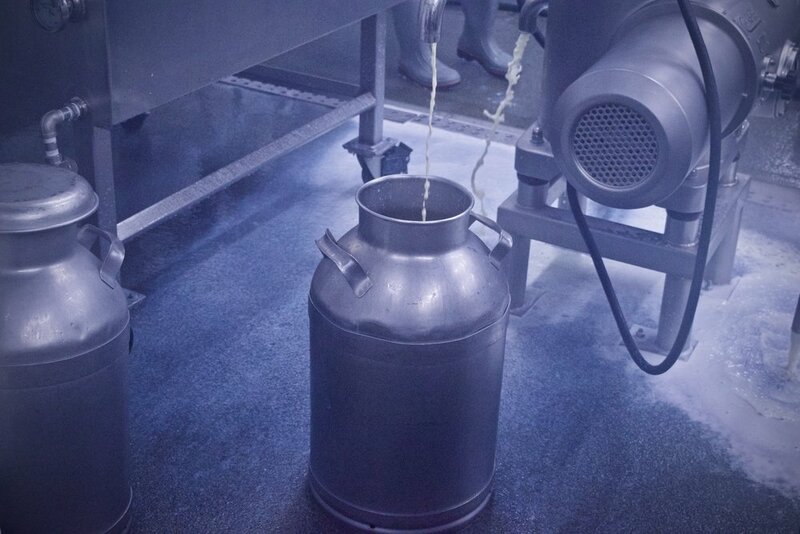 Cherry Valley Dairy is a sustainable, Jersey cow farm that produces butter, cheese, buttermilk and other dairy delights. They keep a small herd that they rotationally graze on the pasture to allow for the flavors of the land to truly come through. When the pastures flood in the winter, which they do, sometimes up to 10 feet, they use a haylage from local farms around the area. This fermented hay keeps the flavor of the land present while allowing for the natural ebbs and flows of the pastures. There is a creek that runs through the land that has been certified salmon safe since 2013. The Snoqualmie tribe has restored the creek bed, ridding it of invasive plants, replanting native grasses, and replacing boulders with logs to ease the path for salmon spawning. Early mornings at the farm are an everyday thing even if I'm not used to waking up before dawn. 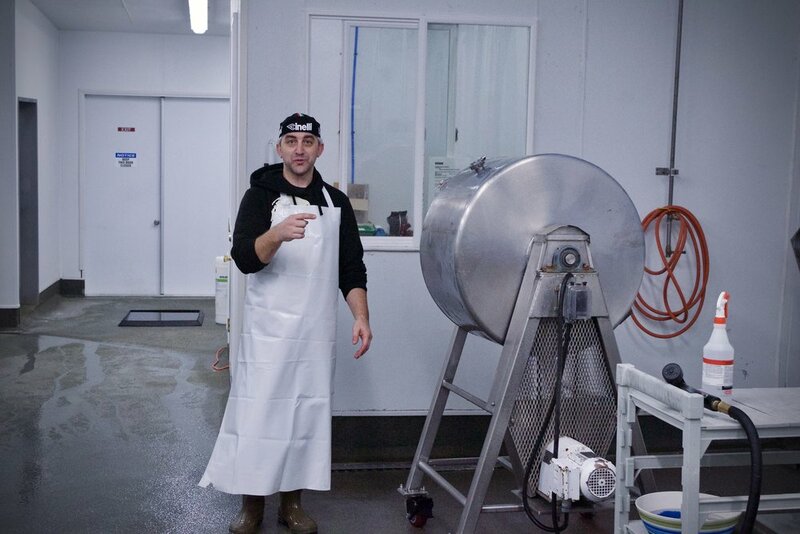 I rolled in around 6am and Blain, the head cheesemaker, and Emily, head of marketing and sales, were already busy getting orders prepped and preparing the milk for it's new life. Ann-Marie, their herd manager, was already busy milking and awaiting a delivery of a newborn calf from her cow that she keeps with the herd. Meghan, the assistant cheesemaker, came in a bit later to help with some of the new projects they have making their way on to stores' shelves very soon. They had warned me that butter making days aren't necessarily the most action packed days on the farm but there was plenty being done and I was more than happy to be there. The fact that they weren't as pressed for time made it easier for them to give me a tour of the land. I've always loved butter but my obsession has really grown over the last couple of years. I honestly think it's one of the truest expressions of quality milk because so little is done to make it happen. I love that with cheese you get to see how milk changes through time and proper care but butter, it's really all about the simplicity. Cherry Valley Dairy won big this last year at the American Cheese Society conference in Des Moines, IA with three of their butters taking a ribbon in their category. They also make a delicious cheese that is aged right there on the farm. The Dairy Reserve is rubbed with cocoa, black pepper, and cinnamon. It has won it's fair share of awards at ACS also. I suggest that if you come across some of this butter (or cheese! )while out shopping, buy some. Try the herbed rose butter on your next piece of toast. (I did this morning and man, what a wonderful treat!) Not only will you be getting something tasty, you will be putting money back in to the community. Now, more than ever, it's important to bridge the gap between cities and rural communities. If you have the ability to make the choice to spend a bit more on your monthly food budget, use it. Your tongue will thank you. Now, it wouldn't be me without some cute animal photos. Here ya go. One of the main things I walked away with was the fact that life continues no matter what political mess may be happening. A new life came to be at the farm that morning and it was the perfect reminder that the work continues. It continues in ways that help benefit people, the land, and the animals. We just have to find it.